To see a meadow in bloom is a great delight—it’s alive and teeming with life, mysterious, dynamic and seemingly out of our control . . . 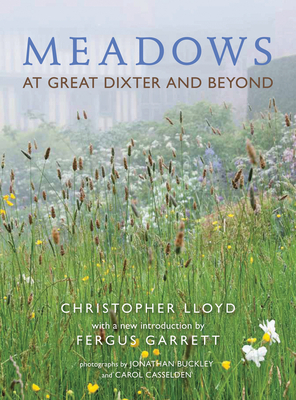 So Christopher Lloyd began his book on meadows, first published in 2004. No one knew more about meadow gardening than Lloyd, who spent much of his long life developing the flowering tapestries in his garden at Great Dixter, in the UK. In Meadows, he imparted that lifetime’s learning, exploring the development and management of meadow areas, explaining how to establish a meadow in a garden setting, and describing the hundreds of beautiful grasses, bulbs, and perennials and annuals that thrive in different meadow conditions. Lloyd's classic text remains at the heart of this new book. However, here Fergus Garrett, Christopher Lloyd's head gardener and his successor at Great Dixter, greatly expands and develops the theme of meadow gardening. Garrett's introduction is accompanied by brand new photography by Carol Casselden. This edition is completely redesigned. Christopher Lloyd (1921-2006) wrote regularly for newspapers and magazines including the "Guardian" and "Country Life," and was the author of many gardening books. He was created OBE in 2000 and also held the highest award of the Royal Horticultural Society, the Victoria Medal of Honour. Fergus Garrett went to Great Dixter as head gardener in 1992 and worked closely with Christopher Lloyd for the next 15 years. He has since combined his full-time, hands-on gardening role at Dixter with writing and lecturing all over the UK, Europe, the US, Australia and New Zealand.